The World Series of Poker has just announced that in 2009 that whenever a player gets thirsty while playing in the World Series of Poker, they will be served on the best in energy drinks and bottled water. These products that will be served are All-In Energy Drinks and Purified Water and these will be the only options for players if they want an energy drink or a bottle of water. With this deal in place between All-In Energy Drink and the World Series of Poker, this means that energy drink superstars such as Amp, Monster and Red Bull will no longer be able to provide their product during any World Series of Poker Event. The length of the deal was not released but it was said that All-In Energy Drink products will be the only products served for years to come to the loyal World Series of Poker players. Last year the World Series of Poker saw more then 100k energy drinks and over 300k bottles of water served during the entire length of the 2008 World Series of Poker. 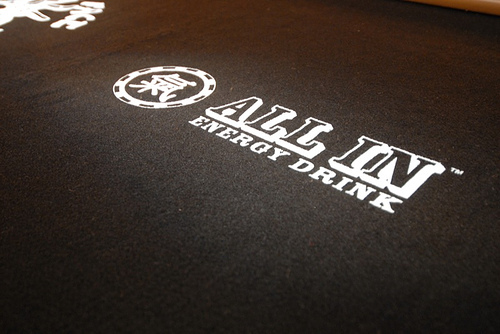 Also another piece of news to note is that during the 2009 World Series of Poker there will be an All-In Energy Invitational Tournament which will have a $500,000 guaranteed prize pool. In order to qualify for your chance to play in the tournament you must purchase products from the All-In Energy website throughout the year.